A new mammography technology allows radiologists to detect more cancers with fewer false positives. Stereoscopic digital mammography produces three-dimensional, in-depth views of breast tissue. In a clinical trial of 1,093 women, stereoscopic digital mammography detected more true lesions than standard digital mammography and reduced false-positive findings by nearly half. CHICAGO - Stereoscopic digital mammography, a new diagnostic technique capable of producing three-dimensional, in-depth views of breast tissue, could significantly reduce the number of women who are recalled for additional tests following routine screening mammography. Results of a clinical trial being conducted at Emory University Breast Clinic in Atlanta were presented today at the annual meeting of the Radiological Society of North America (RSNA). "Standard mammography is one of the most difficult radiographic exams to interpret," said David J. Getty, Ph.D., division scientist at BBN Technologies of Cambridge, Mass. "In a two-dimensional image of the breast, subtle lesions may be masked by underlying or overlying normal tissue and thus be missed, and normal tissue scattered at different depths can align to mimic a lesion, leading to false-positive detections." Stereoscopic digital mammography consists of two digital x-ray images of the breast acquired from two different points of view separated by about eight degrees. When the images are viewed on a stereo display workstation, the radiologist is able to see the internal structure of the breast in three dimensions. In the ongoing clinical trial, researchers use a full-field digital mammography unit modified to take stereo pairs of images. The workstation enables the mammographer to fuse the stereo image pair and to view the breast in depth. As of July 2007, 1,093 patients at elevated risk for developing breast cancer were enrolled in the trial. Each patient received a full-field, standard digital mammography screening examination and a full-field, stereoscopic digital exam, which were then read independently by different radiologists. Of the 259 findings, 150 were false positives, meaning further testing revealed that no abnormality was present. Standard mammography yielded 103 false positives; stereo mammography yielded 53. By the end of the clinical trial this December, a total of 1,500 women at elevated risk of developing breast cancer will have received both the stereo and standard digital mammography screening exams. According to Dr. Getty, offering wide-scale stereoscopic digital mammography would entail minor changes to digital mammography equipment and software. Figure 1. 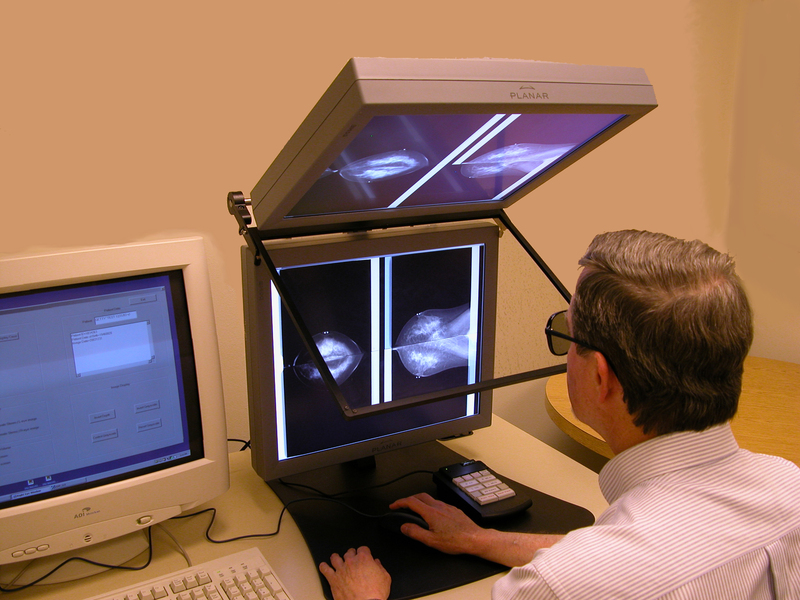 Still image of a radiologist interacting with a stereo digital mammography workstation. Figure 2. 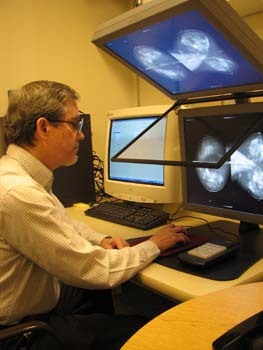 Still image of a radiologist interacting with a stereo digital mammography workstation. Figure 3. 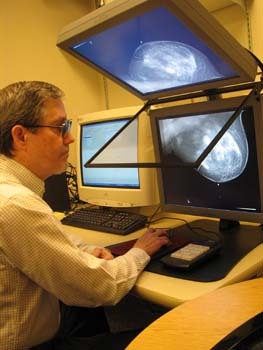 Still image of a radiologist interacting with a stereo digital mammography workstation.